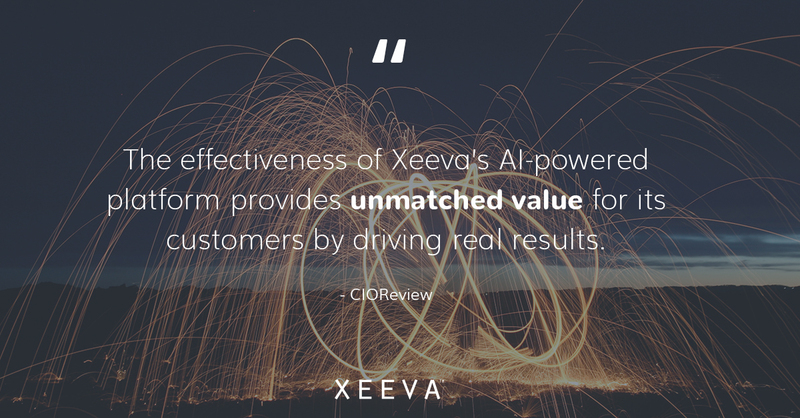 MADISON HEIGHTS, MI, December 4, 2018 – Xeeva, Inc., a global provider of award-winning AI-powered procurement software, announced today that it was featured on CIOReview’s 2018 list of the “20 Most Promising Procurement Solution Providers” for the second straight year. Annually, CIOReview selects the top 20 solution providers offering the best tools and services in the procurement landscape. The list is designed to help CIOs identify the right procurement solution for their organization. It is assembled by a panel of distinguished CEOs, CIOs, VCs, analysts, and CIOReview’s editorial board. Xeeva was among the solutions chosen because it is at the forefront of tackling industry challenges. Its full tech suite creates a unified team with automated buying for faster execution and classified spend data for unlocked insights. By doing so, it eliminates organizations’ frustration of always being stalled by the tactical and allows them to focus on what matter most – growing their business. With the help of its patented AI, the innovative solution simplifies and streamlines the procurement process to drive hyper-efficiency, massive savings, and sustainable results. Xeeva’s innovative technology doesn’t make small, incremental improvements to the procurement process. Instead it shifts the entire paradigm of what’s possible in procurement. It’s been a year of great recognition for Xeeva and its procurement technology. Earlier this year, it was named a 2018 Gartner Cool Vendor for Procure-to-Pay Applications, and it won a SaaS Award for Best SaaS Product for Supply Chain/Warehouse Management, among others. Along with that, Xeeva raised over $40 million in funding this past April to accelerate its growth and amplify its ability to transform how organizations manage spend. This is also the second time CIOReview has included Xeeva on its annual listing of the “Most Promising Procurement Solution Providers”. To learn how Xeeva is disrupting the future of procurement with AI, read the full feature here. Published from Fremont, California, CIOReview is a print magazine that explores and understands the plethora of ways adopted by firms to execute the smooth functioning of their businesses. A distinguished panel comprising of CEOs, CIOs, IT-VPs including CIOReview editorial board finalized the “20 Most Promising Procurement Solution Providers 2018” and shortlisted the best vendors and consultants. For more info, visit: www.cioreview.com. Founded in 2014, Xeeva is a global provider of intelligent cloud-based procurement software and financial solutions for indirect spend and MRO. Used in over 45 countries and available in 18 languages, their software suite automates the source-to-pay process with open communication for procurement, sourcing, and supplier management. Xeeva’s innovative and patented technology is driven by advanced artificial intelligence and simplifies the procure-to-pay process with a focus on driving results – leading to increased productivity, improved compliance and control, and a sustainable bottom line impact. For more information, visit www.xeeva.com.